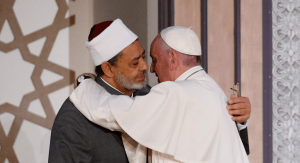 Pope embraces Muslim leader in Abu Dhabi. I want to invite you to experience the mystery of the Passion, Death and Resurrection of the Lord considering this event based on what I wrote last 7th January in a letter to the entire Order about this important anniversary. It urges us to abandon fear and literally open the doors of our mind, allowing God to operate in an unprecedented way in the hearts of men and women of good will who fight without distinction to promote social justice, moral good, peace and freedom to the benefit of all (cf. Nostra Aetate 3)….